Colorful green lawns are not uncommon in the middle of spring or summer across the United States. Beautiful green grass is a lot less common during the winter months, though. However, there are some grass types that are able to withstand heat and cold extremes, including in the transitional zones, and produce that coveted green color during winter: Bermuda grass, zoysia and Kentucky bluegrass. Vivid green coloring in a winter lawn can be achieved with these grasses. In the United States, Bermuda grass can grow as far north as the transitional zone. However, this perennial growing green grass favors high temperatures, even in the winter. So Bermuda grass is limited in growth success by winter temperatures in the transitional zone that exceed 10 degrees Fahrenheit. Bermuda grass will maintain its green color in the winter in the South and lower portions of the transitional zone as long as an average temperature of 50 degrees Fahrenheit is maintained. But that rule can be broken, according to Richard Duble, the turfgrass specialist for Texas A&M's Texas Cooperative Extension. If winter temperatures fall below 30 degrees Fahrenheit at night and are offset by daytime temps as high as 70 degrees, Bermuda grass can still thrive and be green during the winter. Zoysia grass can stay green during the winter months too. In fact, in the transitional zone--where cold season grasses fare better in one part of the state and warm season grasses in another--Zoysia grass will survive in both. This particular winter green grass is hardier in colder temps than Bermuda grass, according to the University of Arkansas Division of Agriculture's Cooperative Extension Service. Damage in the winter to Zoysia grass is less likely, too, than Bermuda grass. But in order for Zoysia to be more than a pale green color in the winter months, plenty of fertilizer must be applied during that period. 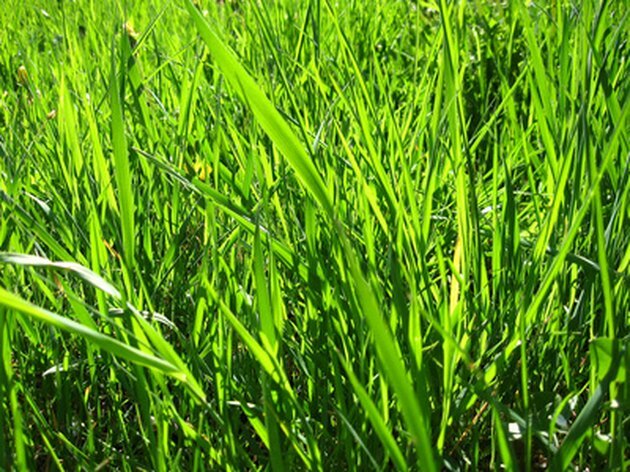 Another grass that stays green during the winter is Kentucky bluegrass. This grass is blue-green in color, cold hardy enough for the Pacific Northwest and tolerant of both heat and shade. Kentucky bluegrass is the most widely planted of the cool-season grasses, too, according to Purdue University's Agricultural & Biological Engineering Department. This grass requires frequent watering and plenty of fertilizer, though, in order to maintain its winter blue-green color. It is tolerant of heat and shade and is disease resistant. Under low maintenance conditions, Kentucky bluegrass will still produce an attractive lawn with winter color.